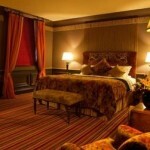 For those who want to live in the most central and most luxurious hotel in Belfast, The Merchant Hotel is the answer. This is a five star hotel rooting back to the 19th century. Still, it has something quite uncommon for five star hotels, free WiFi in the entire hotel. In addition the hotel has a great SPA area with five treatment rooms, fitness room, wellness centre and other relaxing services. The Merchant Hotel is only a few minutes from the Victoria Square, the area with walking streets, restaurant and lots of shops.